Snow shoveling isn't fun, but it's often unavoidable. In areas where snow is no stranger, it's ill-advised to allow even the most meager snowfall to go unshoveled in your driveway, lest it later melt and refreeze. The resulting sheet of ice becomes a slipping hazard. While you can apply ice-melt products to it after the fact, why waste the money? Even those who use snowblowers often have to "touch up" later in certain areas with a shovel. Consult the snow shoveling tips below to the make the job go more smoothly–and to make it less boring, as well. Vow to take breaks: continuous snow shoveling can be hazardous to the health of those in not-such-great shape. "Wax" your shovel blade, making it slippery and thereby preventing snow from sticking to it. Although candle wax, floor wax, or car wax may be used, Pam spray works fine, too. 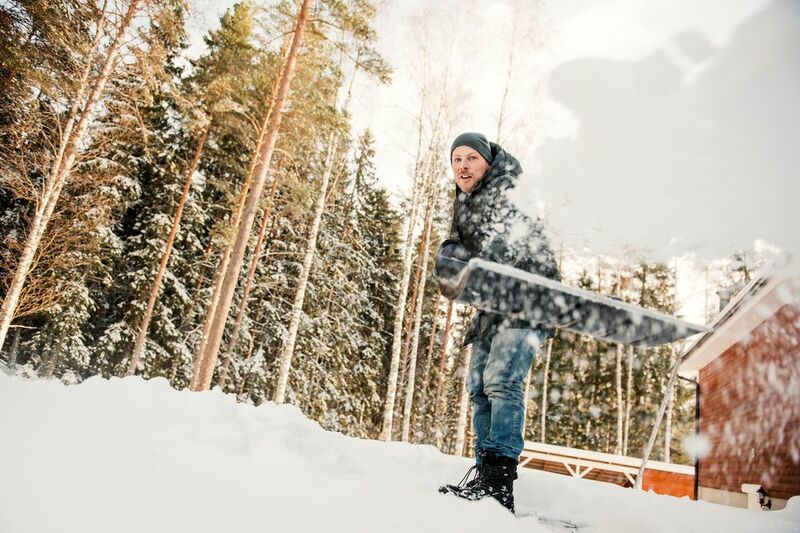 Switch off between snow shoveling right-handed and left-handed, so that you're working different muscles. When the snowfall is heavy (1 foot in depth, let's say), don't try to clean right down to the ground with a single scoop. Instead, skim the top 6 inches off, then scoop up the bottom 6 inches. Otherwise, you could be hurting yourself by lifting too much. Save yourself some time and trouble by clearing a path to the driver's door of your car first. Once inside, start your car and turn on the defrosting mechanisms (front and back). Crank the heat full-blast, even though only cold air will come out initially (it will have a chance to warm up while you're snow shoveling). By defrosting your windows, you make it easier to clean the snow (and ice) off them. Besides, when you're done snow shoveling, don't you want a nice warm car to get into? By clearing a path to your car first, you avoid trampling down snow on the way. Trampled snow has to be removed later, anyway, and it's tougher to remove than unpacked snow. Don't fuss about the rest of the snow around the car just yet. More snow will accumulate there when you clean the car, so you might as well wait till then to clean up around the perimeter of the car. Hold off on snow shoveling (with any degree of thoroughness) where your driveway meets the street. As plows go by, they'll be barricading that area with more snow. Save this area till you're ready to pull out with your car, or till after you've rested up. If you can afford the luxury of clearing a driveway in stages, that's the way to go. If the storm's over, divide the workload into sections; if the storm's still in progress, make a preliminary sweep, then go back after the storm. When you're snow shoveling, don't create huge piles right along the edge of your driveway. For one thing, some of the chunks will end up tumbling down back into your driveway, meaning you have to remove them twice. Instead, heave each shovel-full a decent distance away from your driveway. You'll be glad you did when the next storm makes its deposit: because, when that time arrives, you'll have a little more room to play with. Likewise, before you start making piles, take into account what areas should be left open. For example, don't dump the white stuff in front of the door of an outbuilding, especially if you plan on clearing a path to it later. Snow Shoveling Tip: The Icy "Mulch"
Jack Frost may be nipping at your nose while you're snow shoveling, but there's no reason for your mind to become as numb as your nose! That's why you should keep your mind busy while you're slinging Old Man Winter's refuse around. Some plants are more salt-tolerant than others, but there's no sense in taking a chance. While on the subject of plants, keep an eye out for shrub branches that are groaning under the burden of excessive snow. To prevent such branches from snapping, gently brush the snow off them. It can insulate your foundation, too. You line my foundation with shovel-fulls of the white stuff, though this isn't a good idea if you have any drainage issues with your foundation. Along the same lines, a big snowfall can be turned into a nice windbreak, if you aim your tosses properly. When clearing the driveway in winter, make it a point to heave some shovel-fulls up against a fence or standing surface in your yard. This windbreak does double-duty since it also protects some shrubs on the house-side of the fence from wind damage. Would It Be Better to Use a Snowblower? What better time to evaluate your current snow shovel than when you're out snow shoveling? If you find yourself in pain, it may be due to your equipment. Should you switch to an ergonomic snow shovel? You may not receive enough snowfall in your area to warrant the investment. If you have a small driveway, a snowblower may not be worth the bother. Snowblowers take up storage space year-round. Snowblowers are noisy and require maintenance and fuel. Still weighing the pros and cons of buying a snowblower? Reading my review of a Toro electric snowblower may help you make up your mind. A dryer vent blocked by snow is a fire hazard. It also puts you at risk of exposure to carbon monoxide. Denizens of cold climates should make checking that such vents are free and clear of snow build-up part of their snow-removal regimen. When the vent is clogged, it can overheat, resulting in a fire. Besides, that vent is there for a reason: namely, to vent fumes. Whether you use a traditional aluminum shovel or prefer one of those newfangled plastic ergonomic shovels, be sure to remove any snowfall from the area where the exhaust comes out that is deep enough to cause a blockage. This precaution -- easily overlooked by the average homeowner -- could keep your home from going up in smoke. Your first thought in response may be, "But it never snows enough in my region for the snow pile-up around the dryer vent to be deep enough to cause a problem." Unfortunately, it's not that simple. Winds can cause snow drifts to accumulate in some spots that are much deeper than the depth of the overall snowfall level at any given time. If your dryer vent happens to be in such a spot, your dryer exhaust may be prevented from venting properly. Furthermore, if your dryer vent is not far from your driveway, you, yourself may inadvertently be causing blockage when you're snow blowing or shoveling snow. When your fingers are freezing, when your nose is running, when your eyes are tearing up from the cold, you may not be thinking as clearly as usual. You may be throwing snow right over your dryer vent and the surrounding area without realizing it. If you can easily envision this happening to you, make it a point prior to the snowy season to delineate the path leading from your driveway to your dryer vent. It doesn't have to be anything fancy: perhaps just a few stakes that will serve as a reminder that you'll want to avoid piling up snow banks here. Otherwise, you may end up having to shovel the same snow a second time later in the winter in order to clear the way to your dryer vent. And if you hire someone else to shovel snow for you, be sure to explain this reasoning to them. Any other exhaust systems you may have around your home are venting properly. The fire hydrant (if any) near your property is being kept clear of snow so that the fire department has easy access to it in the event of a fire emergency. Your house number can be read clearly from the street, in case an ambulance has to find your house. Snow is removed from around street drains (remember, when the snowfall finally melts, the runoff can cause problems of its own unless drainage systems are kept up to par). Make sure you know exactly where the drain is before you need to get at it. By the end of a long, snowy, winter, a veritable glacier of ice and snow may have piled up in such an area, hiding it from view. When you're hacking your way through ice, you don't want to have to go on an expedition to locate the drain. That would mean a lot of extra shoveling. So, in fall, take note of what feature on your property the drain lines up with. Snow is removed from roof areas with a roof rake, as/if needed. Are You Raking Your Leaves the Right Way?